The idea for starting the Family Fun Center came to our founder, Eddie Reznicek, when he was playing outdoor miniature golf on a family vacation. It was hot and the air was thick with mosquitoes, but he saw that there were many people playing in the midst of it all. He felt that there must be a more enjoyable and comfortable way to enjoy a game of miniature golf with his family than in those uncomfortable conditions. 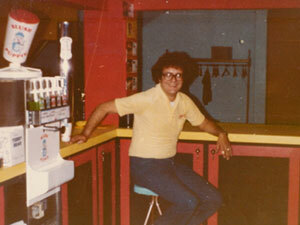 In 1980 Eddie decided to sell his partnership in his abstracting business and open an indoor miniature golf course in Fremont, Nebraska where he was living at the time. He has extra space after designing the golf course, so he decided to put in a few of these "video game" things that seemed to be growing in popularity at the time. Looking to expand, he opened a second location in Grand Island, Nebraska. In this location he decided to double the amount of video games that the Fremont Family Fun Center had offered. Still not satisfied with the volume of business he took a gamble in 1982 and opened a third location in Omaha since it was the largest city in Nebraska. He found a large vacant building on the busiest intersection at 72nd and Dodge. This location did such a large volume of business compared to the other locations that he made the decision to close the Fremont and Grand Island locations within a year and focus on the Omaha location only. At its opening the Omaha location featured 36 holes of indoor miniature golf, and Eddie decided to go with his heaviest mix of video games of all 3 locations by putting about 100 video games in. This made the Omaha Family Fun Center the largest arcade in the entire Midwest at the height of the golden age of arcades. Gradually even more miniature golf holes where removed to make more room for the popular video games until Eddie finally settled on 9 holes of mini golf. In addition to video games, the extra space was used for more attractions to make it a more complete entertainment experience with attractions like Trampoline Spaceball, Air Hockey, Skeeball, Pool, Basketball and many others. 1982 - The Family Fun Center Opened with 36 Holes of Miniature Golf and 60 Video Games including Ms. Pac Man, Donkey Kong, Asteroids and Space Invaders. 1984 - The Family Fun Center Added Spaceball as a new attraction. 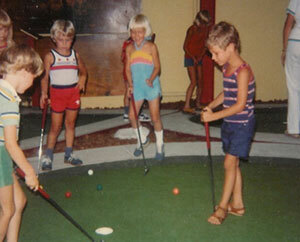 1986 - Because of the 80's video game craze, some of the original 36 Holes of miniature golf were torn out and replaced with more video games like Star Wars, Track & Field, Gauntlet and Choplifter. 1988 - By now, the Family Fun Center tops over 250 video games still adding new ones like Tetris, Cyberball, Street Fighter, and Double Dragon. 1990 - Family Fun Center Added Jackpot Redemption Games that dispense tickets and enabled people to win TV's, Stereos, Bicycles, and large Stuffed animals. 1994 - The last of the original 36 holes of miniature golf were torn out and the new "Walk In The Park" Golf Course was built complete with chirping birds, trees and a cascading waterfall. 1996 - Family Fun Center added Fresh Baked Pizza to its menu and became a big hit with its popular birthday parties. 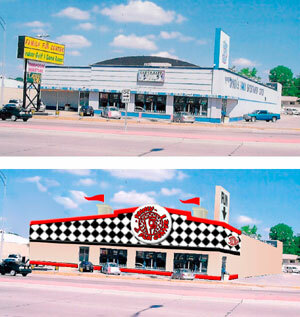 1998 - Family Fun Center made plans to add a Family Friendly Pool room that has now become a staple attraction. 2000 - Family Fun Center tested their first music style video game that had been such a craze in Japan. Today Family Fun Center has one of the largest selection of music games in the United States with games that let you dance, play guitar, be a disc jockey, and play the drums. 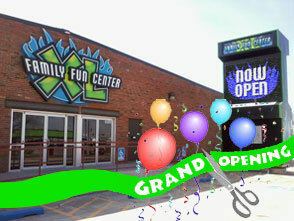 2002 - Family Fun Center made its largest expansion in history adding 7,000sq feet of space to the back of the building. This expansion gave more room for the customers to have fun and offered more room for new attractions. 2003 - Family Fun Center added a new level that is the home of its newest attraction. Family Fun Center will be adding 16 computers for online and network gaming. FFC customers will have the option to play many different popular games with and against people all over the world through the Internet. 2004 - Family Fun Center added its now popular lazer tag arena featuring a state of the art light and sound system and special lazer tag birthday party packages. 2005 - Family Fun Center added Trampoline basketball as well as completely remodeled the outside and inside of facility. Family Fun Center installed on the day before Thanksgiving a new landmark icon 25ft double sided video game sign featuring 2 full color daktronics motion signs. 2007 - Our big promotion this year was "52 New Games and Attractions in 2007." That means one new game every week! Some of the big attractions included Football Frenzy, FunRock rock climbing wall, and the KidZone play area with a huge inflatable-bouncer/slide. Games have included classic 80's games like Centipede, Asteroids and Qbert - New video games like Motor Raid, Guilty Gear Accent Core, and Marvel Ultimate Alliance - Music games like Pop-n-Music, Beatmania Distorted and Pump It Up - and Great prize games like Deal or No Deal, Super Bank It, and Bowler Roller. 2012 - Our biggest year yet!!! We celebrated our 30th Anniversary and also MOVED to our new Family Fun Center XL location on 108th and L Street on March 23rd! 2013 - We added an exciting brand new attraction called Lazer Maze, where you try to crawl through a room full of lasers without touching them to go the fastest and get the most points possible. 2014 - The biggest change to our food menu in 32 years took place when we added a Unlimited Food & Drinks Buffet this year. It featured Pizza, Salad, Hot Food, Drinks and Dessert and was an immediate hit, especially with birthday parties.